Today we decided that an effective resolution of 200x150 was not enough pixels for a game with lots of text in it. So we increased it to a luxurious 400x300. We kept the same palette -- let's not get carried away. 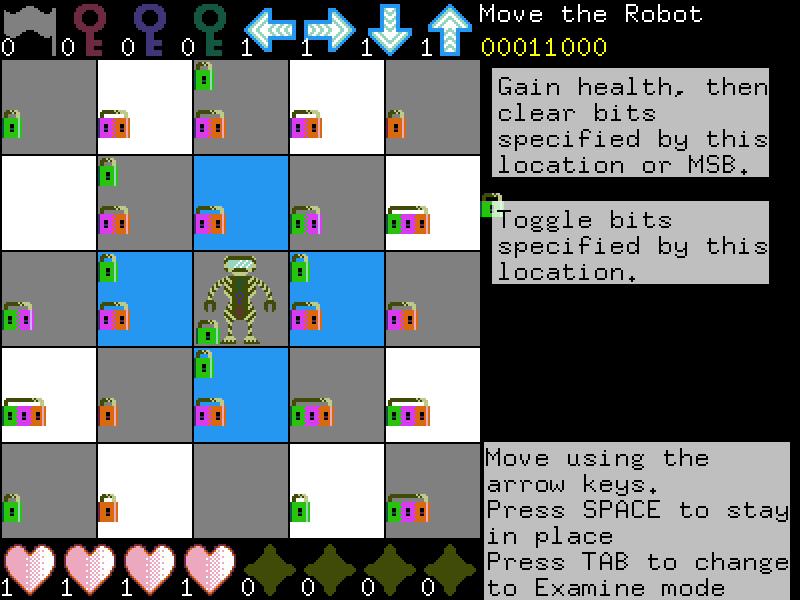 You can now preview squares as well as moving the robot. Legal moves are highlighted. There are more actions. If you lose, the game makes you feel bad. I don't know what happens if you win, because the game is hard. I need to make this entry longer so that the screenshots don't run into each other. The striped pattern on the robot is a homage to the markings of the only naja species endemic to southern Africa. Now that we have all this space, we will soon be adding more information about actions to the squares on the board.